Malama Maui Nui (Community Work Day) has launched a new Youth Education program to challenge the way young people look at trash. The new program—launched in March—was designed to engage Maui’s youth with a hands-on art project that emphasizes the positive impact that litter prevention and recycling can have on their lives. MMN will host 12 youth eduction projects over the course of the spring. The projects, held at various youth organizations, will demonstrate how traditional trash can be recycled and rediscovered to create pieces of art. City of Honolulu Art Commissioner Esther Pridgen will work on the project to help design and lead the first of the hands-on art projects. Pridgen’s initial project involves turning scrap wood, leftover craft materials, pieces from old board games, and more into a representational “junk art” wall hanging. Pridgen begins each presentation by answering questions about recycling. She then sets some simple ground rules for the kids–primarily–there is no wrong way of doing art. Pridgen stresses that the children are to have fun in the process as they search through stashes of beads, tickets, cards, stickers, and other forgotten items that, prior to the program, were tucked away in corners of the clubs and youth centers where the projects take place. About 85 youth from the Haiku and Paukukalo Clubs of the Boys & Girls Clubs of Maui, as well as the Kihei Youth Center and the Paia Youth & Cultural Center, have participated in these projects so far. 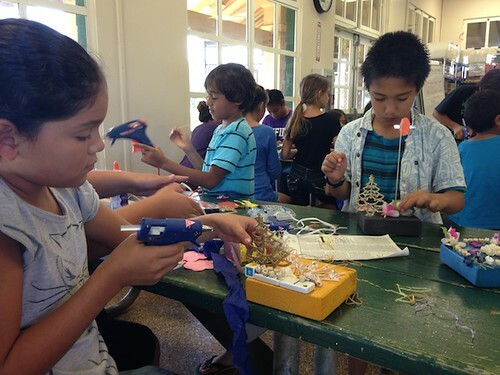 MMN hopes to further develop the initiative by presenting an array of hands-on art projects by different teaching artists so that Maui’s young people are exposed to numerous ways of creatively recycling and re-purposing materials. Aloha everyone, just letting you know I do so many other types of art workshops including workshops that educate on how I use art to deal with issues involving trauma, abuse, inner critic, and much more. Any age welcome muliti mediums to work with.